A frequently discussed setup is “The Squeeze” which occurs in situations of low volatility. The scenario is used to identify situations when the market is building up momentum for its next major move higher or lower. 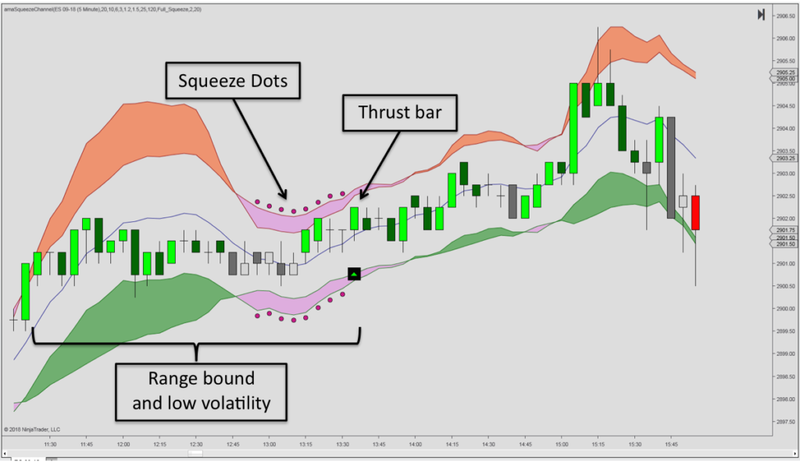 Two versions of the squeeze setups are particularly well known: John Bollinger’s described in his book “Bollinger on Bollinger Bands®” and John F. Carter’s from his book on “Mastering the Trade”. Briefly, the Bollinger Bands display standard deviation levels above and below a moving average. The bands widen during periods of high volatility and narrow during less volatile periods. A Squeeze occurs when the Bollinger bandwidth, i.e. standard deviation, reaches a minimum for a 120 bar lookback period. Bollinger then suggests different methods for identifying the direction of breakouts, for example using the Relative Strength Index (RSI) together with a volume-based indicator. 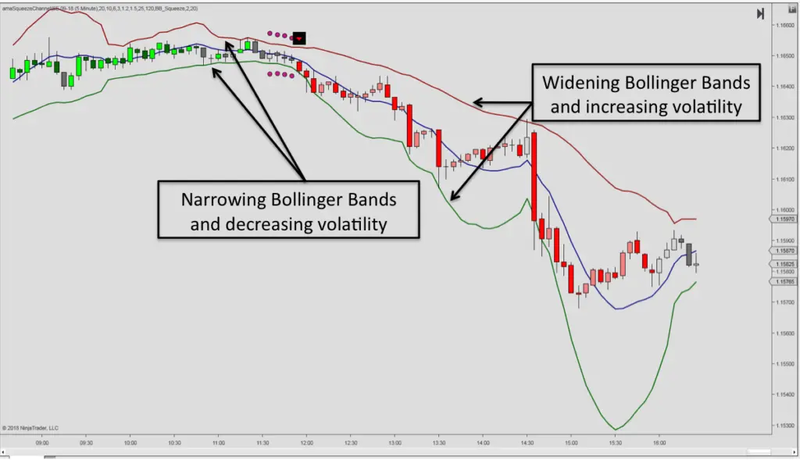 Carter’s approach compares the Bollinger Bands with the Keltner channel. If the Bollinger Bands narrow in width to a point where they are inside the Keltner Channel, it constitutes a Carter Squeeze setup. Carter basically compares true range volatility with directional volatility. Therefore, it is not necessarily a low volatility scenario, but a situation that occurs in consolidating or sideways markets. 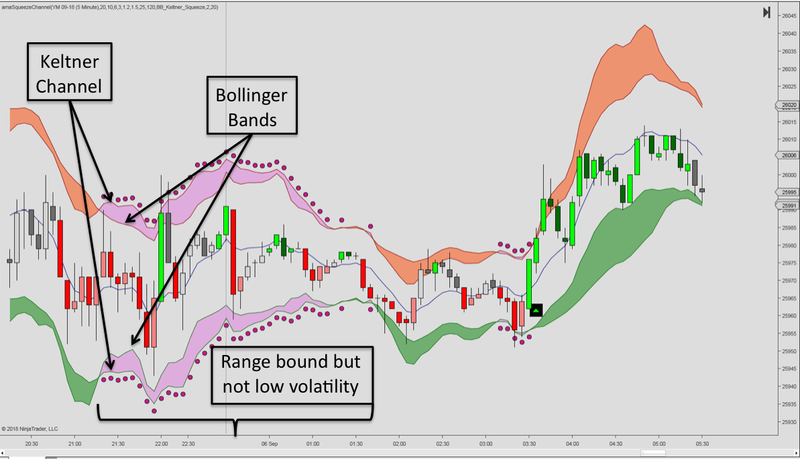 Breakout occur when the Bollinger Bands move back outside the Keltner Channel and Carter validates these setups by using a 13 bar momentum period. A low volatility squeeze: This occurs when the standard deviation reaches a period of low volatility, compared to the 120 bar lookback period. A consolidation squeeze: This occurs when the Bollinger Bands narrow in width to a point where they are inside the Keltner channels (range bound market). Full squeeze: Occurs when both of the above scenarios apply at the same time, i.e. low volatility as indicated by standard deviation for the lookback period, and low true range volatility. For the Bollinger Squeeze, the volatility has to be low (but not minimum) when compared to the 120 bar lookback period. By default, the threshold is set to 1.2. By increasing this value, the low volatility definition will become more stringent, effectively delivering fewer low volatility setups. All of the above squeeze breakouts must be aligned by two momentum periods, 10 and 25 bars. In order to eliminate distortions from the lookback period and reduce the number of noise signals, the Balanced Momentum calculation is applied. Finally, the squeeze breakouts have to confirmed by price action, i.e. Thrust Bars. For long signals, the signal bar has to close above the high of the previous bar. For short signals, the signal bar has to close below the low of the previous bar.